Who is this woman in white and where did she come from? What is her secret? Walter Hartright, a poor drawing teacher, finds himself in the middle of an inexplicable mystery. Somehow his future is intertwined with an elusive woman in white who harbors a dreadful secret... a secret so damaging that her life is in danger. 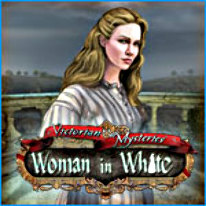 Explore Victorian mansions, search for clues, uncover diabolical plots, root out the lies, and discover the truth!